Easy Zafrani Pulao Recipe | How to make Zafrani Pulao | Indian Saffron Rice. It is a delicious aromatic pilaf flavoured with saffron and whole spices which is extremely light on palate and heavy on flavours. 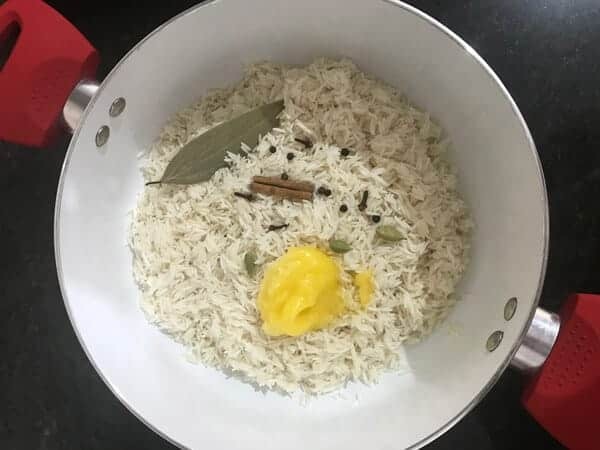 This simple quick and easy zafrani pulao recipe pair very well with any Indian curries like paneer butter masala or shahi paneer ot matar paneer. 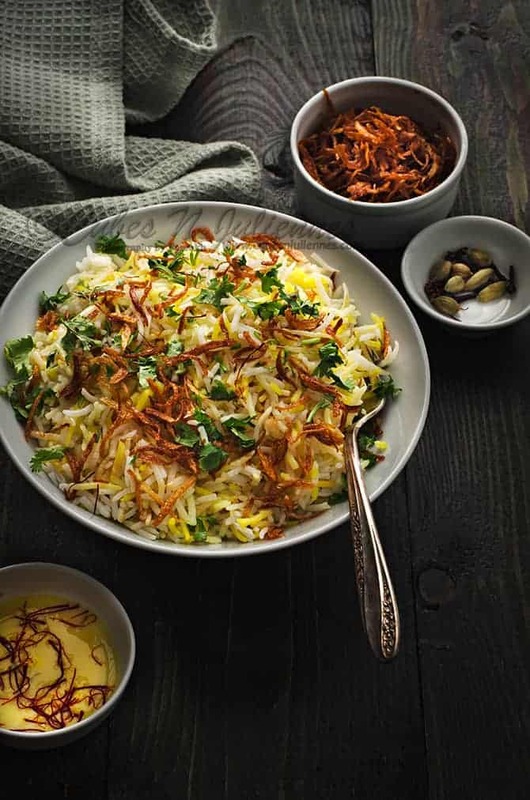 This zafrani rice is on the go for us anytime, be it weekend dinners with family or to serve it to the guests. I promise, this recipe will never ever disappoint you. 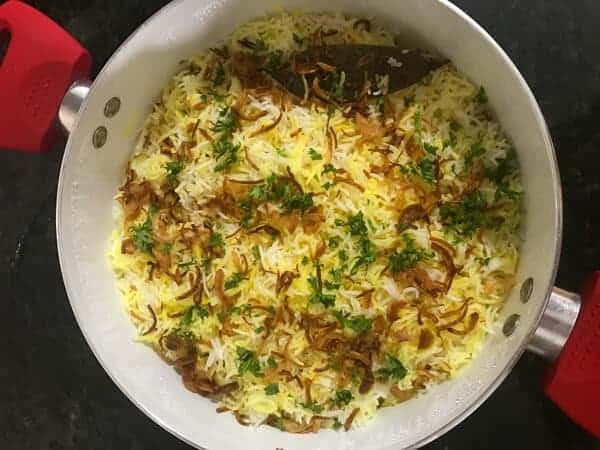 Here is how to make zafrani pulao at home…. 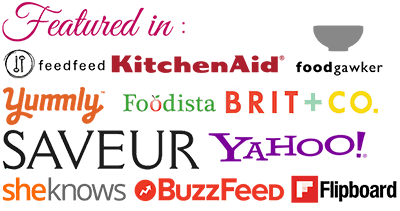 The word Zafrani means “flavoured with saffron”. Zafrani pulao recipe is an Indian aromatic rich rice dish or pilaf flavoured with saffron and spices, hence Indian Saffron Rice Recipe. Sometimes the zaffrani pulao is flavoured with dry fruits and nuts also. Saffron is also called as “Kesar” in hindi. Most of the time, you will see, people do add saffron colour to the dish in context to the word zafrani. 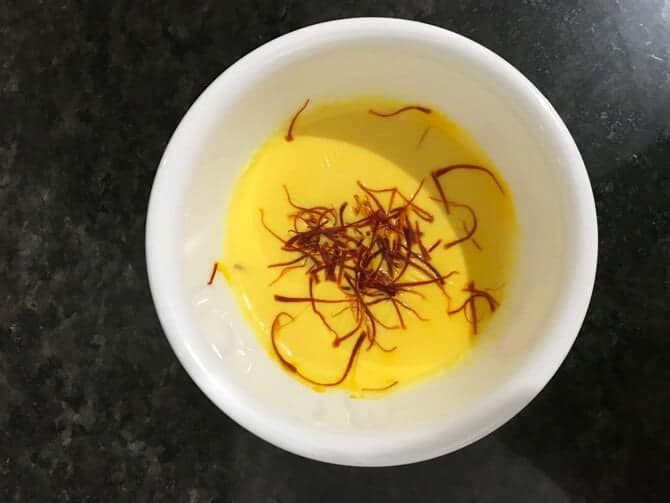 However, the authenticity of any zafrani dish is only due to the addition of saffron or kesar and not the saffron colour. To make authentic zafrani pulao, always use best quality long grain basmati rice. 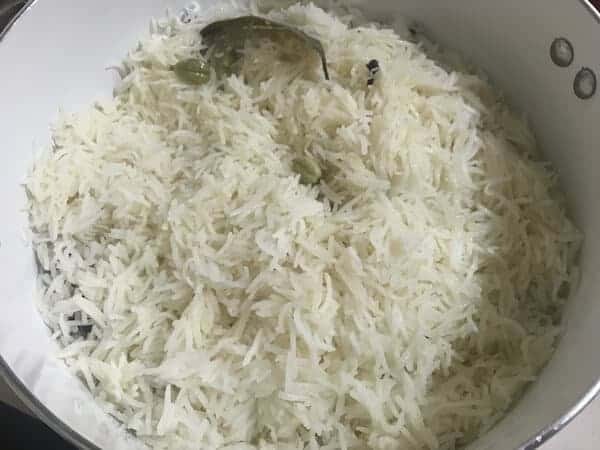 Secondly, do not forget to soak rice for 45 minutes before cooking the pulao. The more the soaking time the better will be rice. After the rice cooks, always allow it to rest for 8-10 minutes and then fluff up the rice with fork. Do not fluff it up immediately after it cooks, as it will break the grains of the rice. 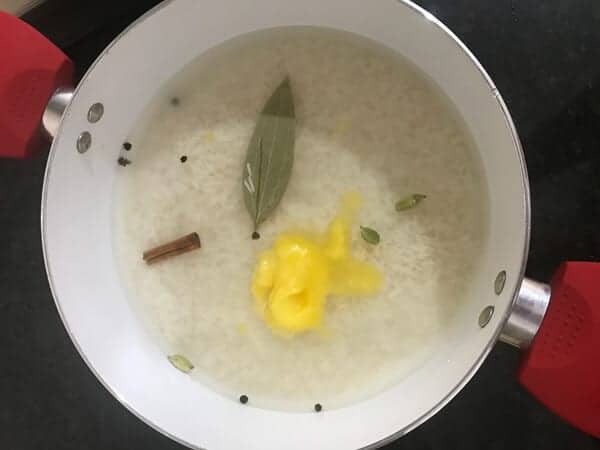 If you wish to make vegan saffron rice pilaf recipe, then, swap ghee with oil and soak the saffron in water instead of milk. To make it as easy zafrani pulao recipe with dryfruits and nuts, just fry the nuts of your choice in ghee and top it over the rice while serving. Do not skip the garnish of birista or golden fried onions as it enhances the appeal and taste of the rice pulao. You can make them in bulk and freeze, here is the link. 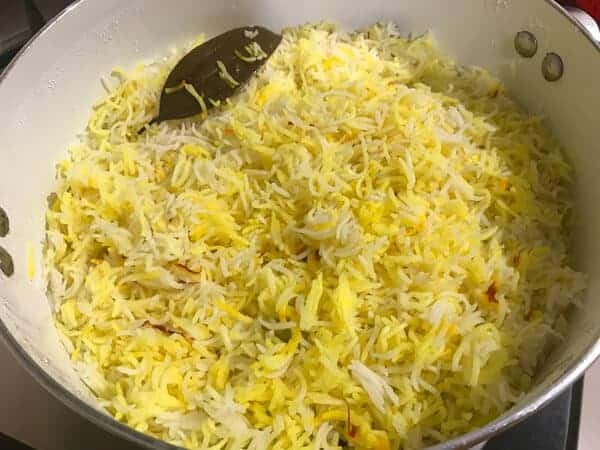 Can we make zafrani pulao recipe ahead of time? Yes, we can make rice pilaf ahead of time and even refrigerate it. Rice rice pilaf stays good in refrigerator for 2-3 days. You can reheat it in a microwave and serve it as and when in need. Can Zafrani Pulao be frozen? Yes, we can freeze saffron rice pilaf in clean air tight container. Saffron rice an also be frozen in portions. All you need to do it, thaw at the counter and re heat it in a microwave whenever you wish to eat it. It is as good as the freshly made saffron rice. 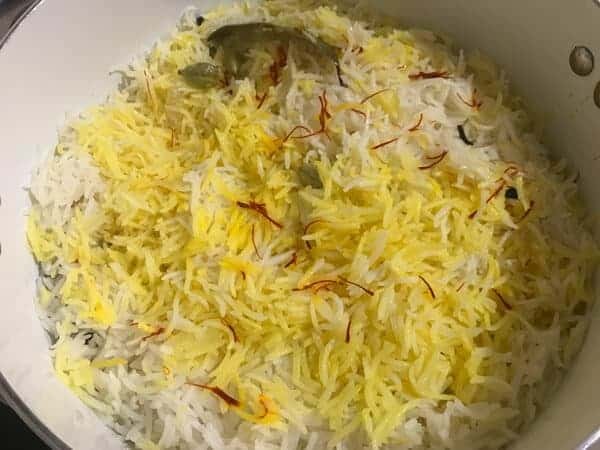 As the recipe I am sharing below is quick and easy zafrani pulao recipe hardly require any exotic ingredients apart from saffron or zafran. All we need for this easy zafran pulao recipe is good long grain basmati rice. Then, the other ingredients we need here are, cardamom, cinnamon, cloves, bay leaf, ghee, salt and water. Do follow the steps and make best saffron rice pilaf recipe recipe in minutes. 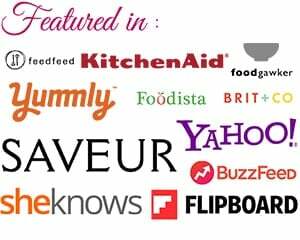 What to serve with zafrani pulao? You can serve zaffrani pulao with any Indian curries and even with the curries from different cuisines around the world. Serve it with methi chicken or chicken kali mirch, gosht korma, Dal Makhani, Paneer Pasanda, Paneer Butter Masala and many more dishes of your choice. Now, once the rice is cooked to 90%. then pour saffron soaked milk on the top, Cover and simmer until done. Dish out and garnish with fried onions and chopped coriander leaves. Delicious easy zafrani pulao is ready to be served. First soak the saffron in milk for couple of hours. 5. Now, once the rice is cooked to 90%. then pour saffron soaked milk on the top, Cover and simmer until done.